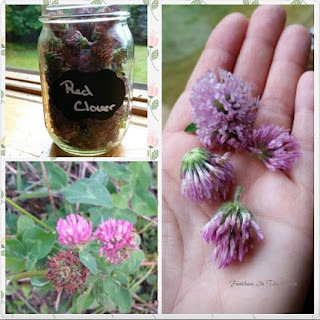 Red clover is one of my favorite herbs to use. Red clover (Trifolium pratense) is often thought to be a weed since it has the tendency to show up in unkempt areas like roadsides and empty lots. Since it tends to grow wild, it's easy for me to find on my foraging walks. It is a perennial plant and is a member of the legume family. It's often used as a cover crop or grazing crop and helps to improve the soil. 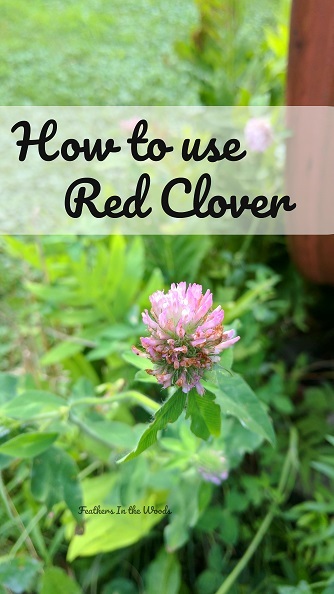 Truth is, red clover has a ton of wonderful uses! Red clover is high in many vitamins and minerals and it has a long history of uses in herbal healthcare. Also, the flowers are edible and make a lovely garnish for desserts. Red clover is one of the first herbs I tried when I started using herbs back in the early 90s. I had read in a little booklet called Historical Uses of Herbs that it was good for certain female issues and for stress. I had both of these problems so I started drinking red clover tea daily and the problems sorted themselves out in a few months. After that I was hooked! I read everything that little booklet said and tried every herb I thought I needed. Over the years I've used many herbs but my love affair with red clover has never waned. Now I'm lucky enough to find red clover growing wild and no longer have to buy the tea or look for a bulk herb shop. I gather the flowers fresh from spring till fall and dry them in my dehydrator. I can usually collect enough to last all year by visiting the same spots a few times. Red clover blooms continuously throughout the season so it will replenish itself. To harvest red clover simply snip the flower buds off above the first set of leaves. I spread the red clover flower heads on a tray and set my dehydrator at 95° and let them dry for a few hours. They're dry once they feel crispy. Here's how I store my herbs using glass Mason jars. They will keep for at least a year before the quality starts to deteriorate. Red clover is obviously edible. Many people like to break apart the fresh flowers and use the individual florets as garnish on desserts and in drinks. The blooms tend to be sweeter in the spring then in the fall, so if this is your intention plan accordingly. Here are some of the many amazing properties of red clover. Red clover constituents are thought to stimulate the immune system. It's been used for coughs and respiratory congestion. Helps to reduce menopausal symptoms. High in calcium, magnesium, niacin and vitamin C.
Can help improve arterial health and boost circulation. Contains isoflavones which can increase 'good' cholesterol and keep blood clots from forming. Can be used topically for skin irritation. I use it in my sunburn bath tea recipe. To use red clover, I make a tea by steeping 2 of the dried blooms in a cup of just boiling water for about 10 minutes. Strain and drink. I drink 2 cups a day when I'm using it for health reasons. You could also buy red clover herb capsules but you've probably read why I don't trust herbal supplements, so of course I'm going to recommend buying the tea or whole dried herb, foraging or growing your own. Red clover contains a blood thinning substance called coumarin. For this reason it should not be used by persons who are on blood thinning medications. Should not be taken by women who are pregnant or breast feeding. For more info on Red clover including links to medical studies...click here. I am not a doctor or other health care professional nor do I claim to be. I am simply passing on information that has worked for me. This information is not medical advice and is for entertainment purposes only. Please see a Dr if you are ill. Click for my full disclaimer. It sounds like a very useful herb. Thanks for sharing and making the information so practical. Ohhh, I've never tried Pau d' Arco in tea! I'll look into that. Thanks! Thanks for such an informative post Lisa. I'm now viewing red clover in a new light and will definitely have to try that tea. Thank you for sharing at Create, Bake, Grow & Gather this week. I'm delighted to be featuring this project at the party tonight and pinning too! !